Arthur A. Levine Books, 9781338125740, 128pp. Proceeds from the sale of this book will go to Comic Relief, who will use your money to continue improving and changing lives -- work that is even more important and astonishing than the three-and-a-half-second capture of the Golden Snitch by Roderick Plumpton in 1921. Kennilworthy Whisp is a renowned Quidditch expert (and, he says, fanatic). 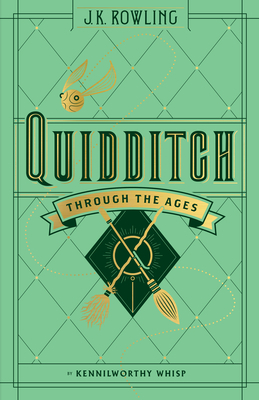 He is the author of many Quidditch-related works, including The Wonder of Wigtown Wanderers, He Flew Like a Madman (a biography of "Dangerous" Dai Llewellyn), and Beating the Bludgers -- A Study of Defensive Strategies in Quidditch. Kennilworthy Whisp divides his time between his home in Nottinghamshire and "wherever Wigtown Wanderers are playing this week." His hobbies include backgammon, vegetarian cookery, and collecting vintage broomsticks.